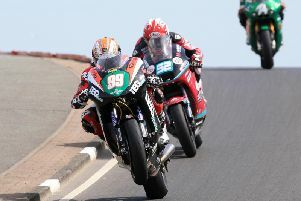 British Supersport Championship title challenger Glenn Irwin made a big impression on his competitive debut at the North West 200 on Tuesday, finishing fifth fastest in the Supersport class. The Carrick rider has stated his aim of finishing on the rostrum at least this week as he makes his race bow at the international meeting, with Irwin even suggesting a victory is not out of the question. And the 25-year-old backed up his bold claims with an excellent performance in tricky conditions around the high-speed 8.9-mile course to finish fifth fastest on the ZX-6R, lapping at 102.014mph to finish the wet session 6.1 seconds behind provisional pole man and former British Supersport rival Alastair Seeley. “It’s so fast – even more so than I expected – and the chicanes just come up on you,” said Irwin, whose dad Alan was on hand yesterday to provide the circuit rookie with some sound advice.